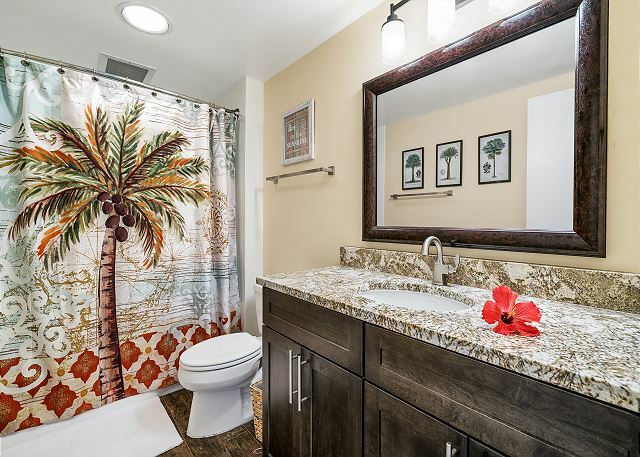 This newly remodeled condo has 2 bedrooms both with a King bed. The loft located above the living room is equipped with two Twin beds. 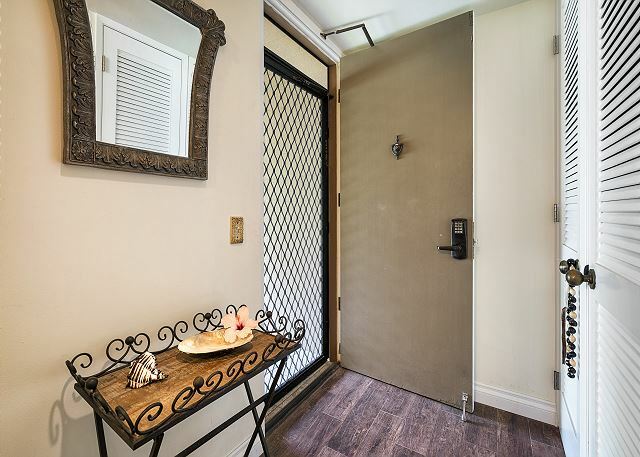 This unit is located on the third story which means guests will need to be comfortable with three flights of stairs. 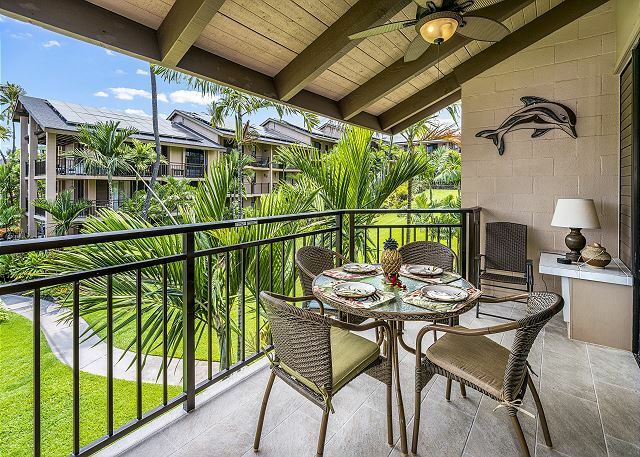 Kona Makai is an oceanfront condominium complex of about 100 one and two bedroom units located one mile from the beautiful town of Kailua-Kona. Amenities include an ocean-side swimming pool, jacuzzi, tennis courts, cabana area and barbecue area. The whole complex is surrounded by lush manicured and landscaped gardens overflowing with tropical flowers. 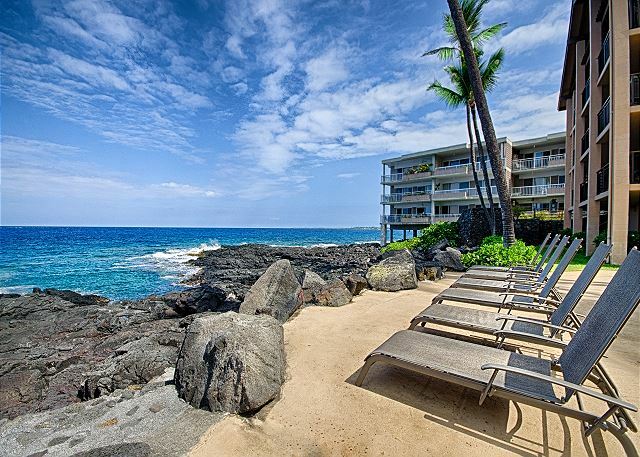 Enjoy spectacular ocean views, sipping a cup of Kona Coffee while dolphins and whales (when in season) are splashing around right in front of this oceanfront complex. The complex has direct access to the black lava Coast of the Pacific ocean for spectacular snorkeling and/or diving and is just a couple of miles down the shoreline from several wonderful beaches with opportunities to enjoy the graceful green sea turtles. Community has on site pool, tennis, hot tub and ping pong table. If you are seeking local markets and historical context, downtown Kailua-Kona a short walk (1 mile) away for access to shopping, businesses, waterfront restaurants and hotels. Watch the people and the cruise ships come and go from the Kailua Pier. Visit the famous Farmer's Market. Enjoy a shave ice or a cup of Kona coffee, have a light snack or a gourmet meal, buy an inexpensive souvenir or a piece of fine art, book an activity, go for a swim or hang out on the many beautiful beaches. Condo - great however carpet needs a re-do. We had a very nice stay in #2304 with 5 adults. 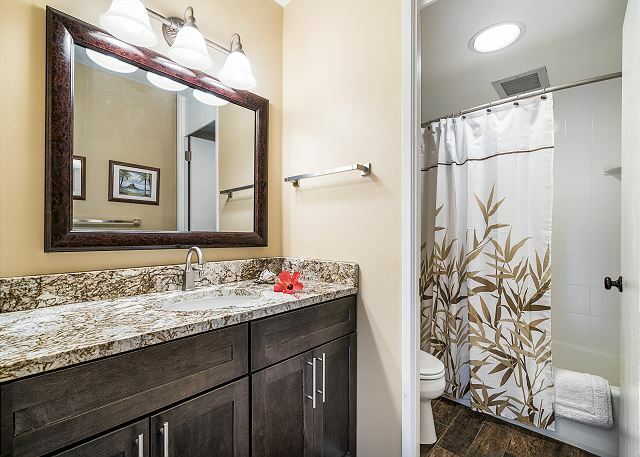 The facility is well maintained and our unit appears to have been recently remodeled with nice granite counter tops in the kitchen, which had everything we needed to cook dinner and save on restaurant bills. The ocean view from the Lanai is very nice and it night you can hear the sound of the waves. The only draw back to the place is the 3 flights of stairs that you have to drag your luggage up. Other than that, it's a great place. I really enjoyed grilling burger on one of the three gas BBQ grills right at waters edge, watching the sunset and relaxing at the end of the day. Thank you for your review. We very much hope you return, and please do contact our attentive property manager for our repeat visitor rates which are the best you can access. This is a wonderful unit and just as described. Perfect for our trip with my daughter’s family. Two great adult rooms and the loft for the two children. The grounds are amazing with a great view of the ocean from the outside patio. A fully stocked kitchen. If you like to walk it is about 1.4 miles each way. The coffee shop nearby was perfect in the morning. We contacted the management company with some questions and they got back to us immediately and were very kind and helpful! Perfect location and close to town. Will certainly stay here again if we get back! Aloha and thank you for the review. We are happy that you enjoyed your visit. We would be happy to host you for your next visit. Remember, returning guests who book directly through Boundless Hawaii will be eligible for a 10% discount! 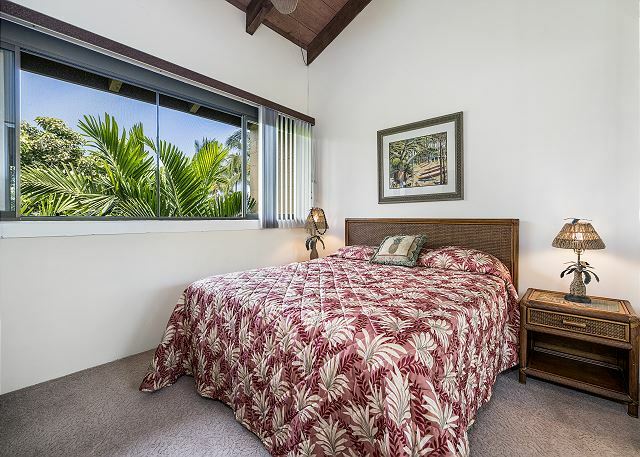 Many Kailua Kona condos in older complexes are in need of updating, this one is no exception. When in Hawaii we spend very little time inside the condo so as long as it's clean and things aren't broken we can tolerate it. Some things that need updating include carpet (carpet shouldn't be in rentals), both bathrooms (no need for two bathtubs), new beds and bedding (two king beds was a plus), the kitchen (especially a dishwasher that works). This is a third floor unit and there are no elevators, 32 stairs. 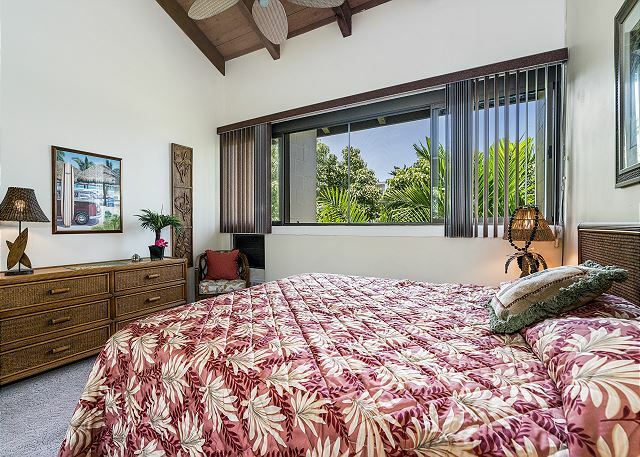 Some pluses, Kona Makai is a nice quiet complex, the grounds are beautifully maintained, staff is very friendly, BBQ area is ocean front and nice, the pool is never crowded, parking was always available and is free and the complex is gated. It's also easy walking distance to town. Kona Makai is a great complex for empty nesters with no grandkids. Young families with small children are rare here. Pool rules limit noise, games and toys so as not to disrupt the tranquility for the elderly residents. When the ocean is calm snorkeling is excellent in front of the condo. If this is your first visit to Hawaii remember there are no bad islands to visit and no bad time to go. Boundless Hawaii has been great to work with too. Nice place and location, with just a couple of nit picks though. Nice furnishings, kitchen very well equipped (utensils, pots and pans) except for the dishwasher not working (rusted racks anyway). Nice dishware (3 sets including a fancy formal set) and tableware. HDTV and decent programming, good internet access. Master toilet constantly runs, and master tub drains slower than shower, so water accumulates in the tub. Being a top level unit, the ceiling/roof tends to heat up during the day, so the unit probably gets a bit warmer than 2nd or 1st level units (not an issue in winter though). Aloha, thank you for your lovely review. We are happy that you enjoyed the unit. We will settle maintenance issues on our end. We hope that you return, as you will receive a 10% discount next visit. Please feel free to call us next time to inform of us any problems so that we can resolve it during your visit. Everything was perfect. 2304 is a great place. It's very difficult to get into Kona Makai so when we found out this was available we grabbed it. We have stayed here a few years ago. Kona Makai is in a great location. Very well kept up. The pool could be a little warmer but otherwise great. If you are looking for a quiet place to stay oceanfront this is it. Aloha, thank you for taking the time to leave provide feedback. We are always happy to host you and look forward to your next visit! The Kona Makai condo facility as a whole is a relatively nice place in a good location for quick access to Kona and the highways in and out. As with any older condo facility with private owners, some living there and some as full time rentals, there is a wide variety of level of condition from unit to unit. Unit 2304 is just "OK". Definitely in need of some update but not so bad that we wouldn't recommend it. Carpets are badly worn, furniture worn and outdated, cabinets are ancient, actually has a tube tv in the main bedroom with a DVD player that doesn't work. The living room tv is flatscreen but old with an old DVD. We tried to watch a couple of movies but the sound is very messed up. Probably most disappointing is the lack of amenities that most owners leave in a typical condo. There are two beach chairs in the closet and that's it. We moved south about four miles to a condo that costs about the same. It has chairs, boogie boards, snorkel gear, binoculars TVs that work and is in much better shape even though it's probably been 8 or 10 years since it's been updated. We met many nice people at Kona Makai and saw some of their units. All in better shape than ours. Still though, I would recommend it, just know it isn't top shelf. Have stayed in the same unit for several years now. New carpeting and and a big new fan on the lanai makes this unit very comfy. Complex is lush and green but not really kid friendly. Much older group looking for quiet is what you will find here. Very comfortable and welcoming both inside and out. Andrea M does not recommend this vacation rental. The condo was cute. It was clean. There was a severe ant problem. We called maintenance but nobody came to remedy the problem. The air conditioners did not work well at all. The location was wonderful. You are just steps away from the shoreline and the chairs are set up for relaxing. They kept the bar b cue area clean. The other residents at the condos were very nice. What a great location and view! My husband parents and I stayed at Kona Makai for two weeks recently. The location and unit were excellent - clean, quiet, and easy access to snorkeling literally just outside the door. The outdoor grill by the ocean was the perfect place to cook dinner and we enjoyed watching the sunsets from our lanai. We would definitely stay here again. Great property, nice people, beautiful grounds. Good job by VRBO. Boundless Vacations seem very professional and dealing with them was a good experience. Two minor defichencies --no dishwasher detergent;carpet stains as you enter the unit.Otherwise it is as advertised---an excellent place to stay.The outside amenities are kept in superb condition on a daily basis. We really enjoyed our stay at Kona Makai. The rental was perfect for our family providing space for all of us. The location was close to many local favorites. We would definitely stay here again if we are ever in Hawaii. We were two couples in this 2-bedroom 2-bathroom apartment. Great complex with beautiful gardens, pool, jacuzzi and bbq area. In Kona, short drive from restaurants, supermarkets and beaches. Quiet, everything you could possibly need was provided, clean and very comfortable. Lanai big enough for meals. Wonderful stay. Booking on the internet is always a risk so we were very thrilled to find the lovely unit in a beautiful garden. Lovely pool, bar b q facilities, king beds in each room. great position. Within walking distance (about 10 mins) to the shopping centre and restaurant area. 2304 is a nice 2 bedroom 2 bathroom unit in need of updating. Very little has been done with it since new in the 70's. Good beds,poorly stocked kitchen,and furniture in need of a good cleaning or replacing. Altogether a pleasant place to stay but could be improved. 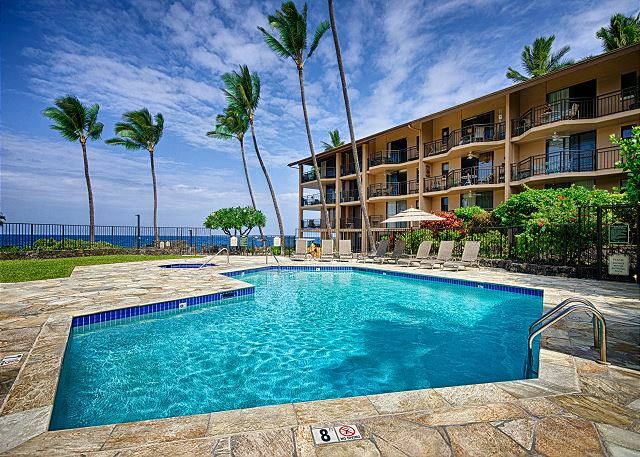 hearty walking distance to downtown Kona. Lovely landscaping,well maintained. We have stayed in 2304 for two years now and have booked it again for next year. Unit is getting a little tired and the carpets and furniture needs a very good cleaning . Lanai furniture too big for space so very hard to get 4 people around table.A fan/light combo on the lanai would help as well. Pots and pans need replacing too. Over all though it's a gem for it's location. We have been a Maui fan for 22 years but now will be staying in Kona at the Kona Makai. It is a fun walk to town for a morning Lava Java and the property has a fantastic ocean view during an evening BBQ. Unit 2-304 was very quiet, spacious and clean with a pleasant ocean view from our relaxing deck. The unit was difficult to find in the dark, better signs would be helpful. Unit a little old but it was clean and we did enjoy our stay. The grounds were beautiful. The staris were a pain after a long race but we managed. Unit needs a little TLC. Carpets should come out and better flooring installed. Cooking pots need replacing- they don't work well on a ceramic top stove. A proper light on the lanai or fan/light combo would be nice. Still gets a 7 out of 10. This condo was a too strict on the swimming pool and hot tub rules. I felt that my kids were not welcome into the place.